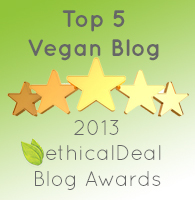 or … What was in my Vegan American Princess Costco Haul? 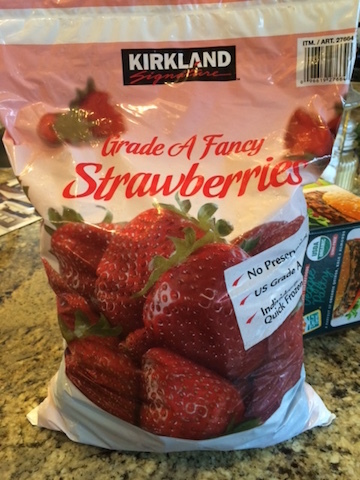 Although Costco has plenty of items I’m not interested in, I still love strolling the aisles and buying fruits and veggies in bulk and discovering a surprising new vegan item or two. Bringing home huge containers of blueberries or a bag of 8 red peppers does take up a lot of room in the fridge but it also gives me motivation to use it or lose it! Put a big bowl of washed, fresh strawberries and blueberries on the middle shelf of the fridge so that whenever you’re trolling for a healthy snack, some nutrient packed berries are just a handful away. I put them in my salads for a bit of sweet-tart punch! The bunches of bananas at Costco are way too big even for a banana a day! Sliced up they go in oatmeal and vegan yogurt, but invariably there’s a few left starting to look a little too spotty and brown for my taste. Those are peeled, and broken into thirds and frozen in aluminum foil. Perfect for smoothies and Yonanas, a great machine that turns bananas and fruit into your own freshly made yogurt shop! 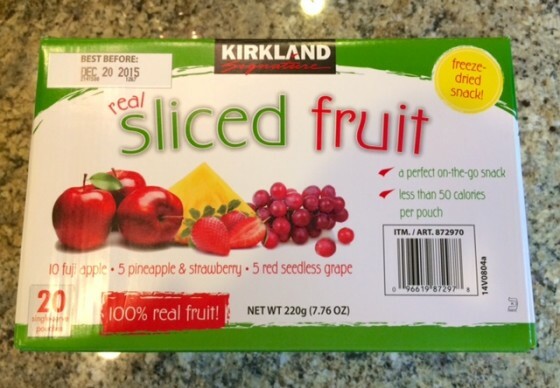 This freeze-dried fruit snack by the Costco Kirkland brand comes in quite handy as a packable on the go snack. Also crumbling it on top of oatmeal or yogurt or on a smoothie works beautifully. 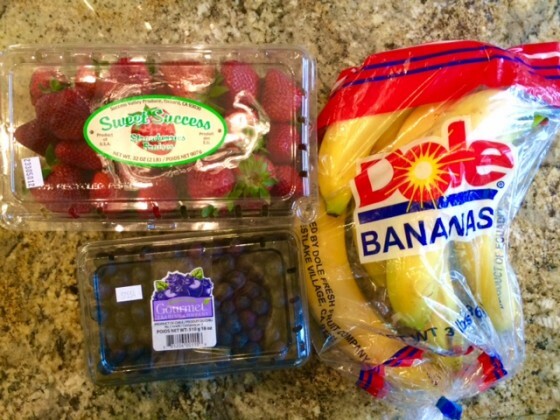 There are 10 packs of fuji apple, 5 pineapple & strawberry and 5 seedless grape. 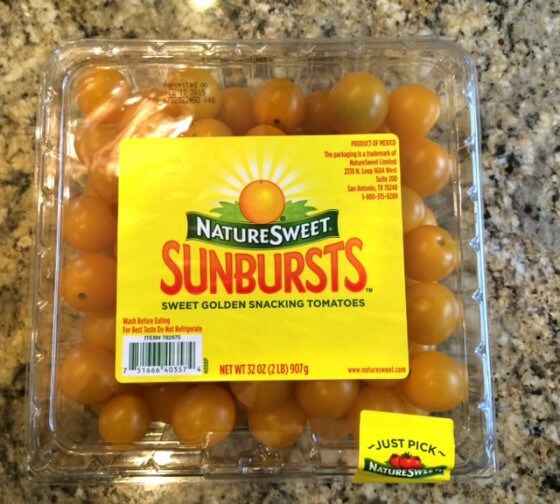 A giant container of yellow cherry tomatoes? So versatile! A bowl of these sitting in fridge is a nice convenient very low calories nutritious treat. I use them all week in salads too. When I have some left over that look a tiny bit beyond their prime, I saute them with some garlic and crush them on top of pasta or rice! 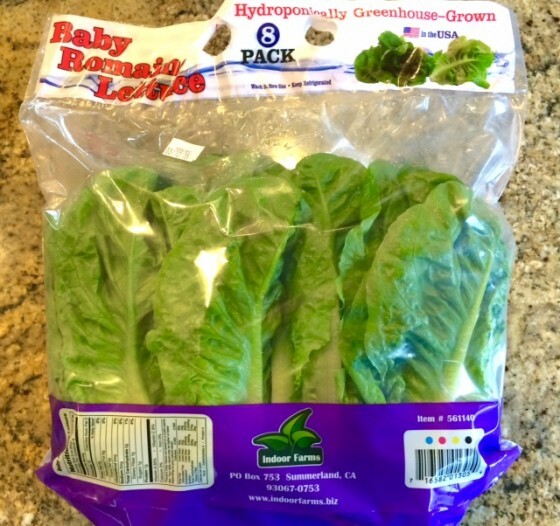 Baby romaine lettuce will be the base of my salads this week. I try to vary the greens I buy because I love arugula and mixed baby greens and kale, but having the same all the time wouldn’t be very exciting. 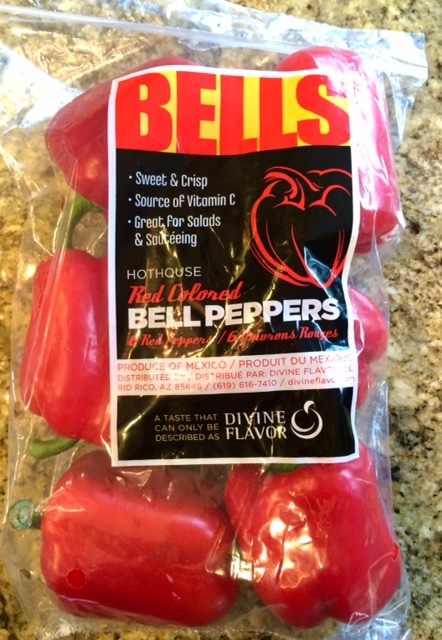 Red peppers are extremely versatile, raw or cooked, whole or chopped. I love them in salad, but also I roast them in some balsamic vinegar and serve them deliciously that way too. And don’t forget to stuff them with all sorts of yummy rice, farro, kasha or meatless ground shreds. You can do so much with these, that maybe this big bag isn’t even enough! Little Cocktail Cucumbers don’t last very long in the refrigerator, so plan on using these soon after buying them. I use them for salads, of course, but also sliced onto sandwiches and to dip perfectly into hummus. 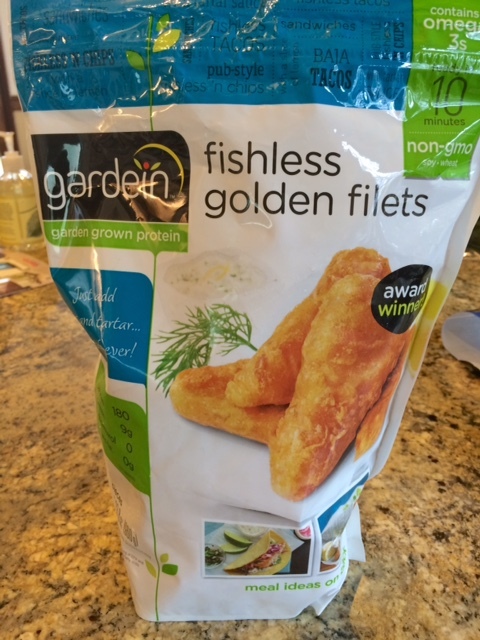 Gardein Golden Fishes Fillets—-these are really hard to believe! How they make these taste and look like fish is beyond a mystery to me but they do! I serve these with a squeeze of some lemon, capers and a dish of vegan tartar sauce and I’m a happy vegan. I know some might consider this to be a processed food, but once in a while, it really fits the bill! This large bag contains 20 pieces which is a nice size for a family (3 pieces each), in contrast with the small bags found in the supermarket with 4-5 pieces in them. I also think kids would love this with organic ketchup! 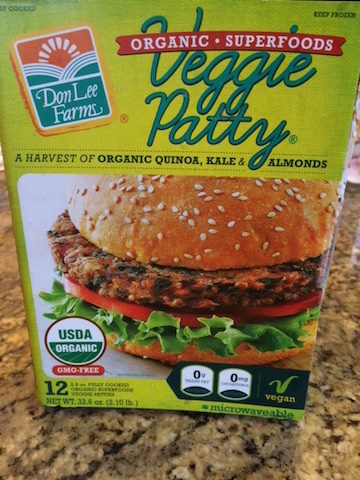 Organic Superfoods Veggie Patty by Don Lee Farms is a new item that I had never seen before! I have to admit that I get excited by nearly anything that actually goes out of their way to put “Vegan” on the packaging! It also says Non-GMO and “A Harvest of Organic Quinoa, Kale and Almonds.” Wow, they have me sold already even before tasting. But after eating one, I am thrilled! I could literally live on these every day! It’s delicious and as far I can see, all good ingredients and low calorie. I think I’ll go back and get another box just to have!! I truly think non-vegans could get on board with this burger. Frozen Strawberries are essential to have on hand to sweeten up your smoothies and also double as ice cubes! I love to always have a huge bag of these and frozen blueberries, as well as frozen kale, in the freezer for vitamin-packed and energy-packed smoothies. There’s nothing worse than hankering for a smoothie and finding nothing yummy in the freezer to make one with! 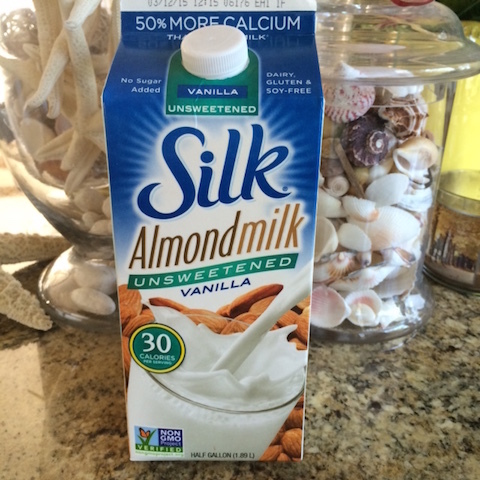 Silk brand Unsweetened Vanilla Silk Almond Milk is found in the frigid refrigerated section of Costco. It comes in a carton of 3 half gallons and is quite a lot of almond milk to have on hand in your own fridge, I admit. We use it in coffee, tea and smoothies. I like this brand because it doesn’t have carrageenan, which has been found to be harmful. I haven’y perfected making my own home made almond milk yet, although I have tried. I need to read “Nut-Milk Bags for Dummies!” As if! So until next time I head to Costco, I have a full stock of lots of great vegan food for meals, snacking and for drinks! For recipes to use it or lose it, see the related posts below! 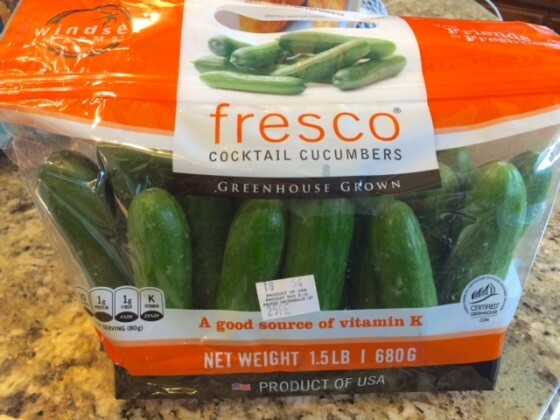 Buying Veggies In Bulk at Costco and 8 Recipes to Use Them All! Freeze Dried Fruit: The Astronauts Are Right! Gardenburger’s Malibu Vegan Burger on a Coco Lite! 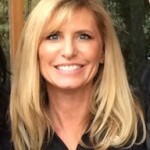 Which Costco did you find the veggie burgers? People all across the country are saying Costco dropped them a long time ago.. The Costco’s in southern California seem to still have them.